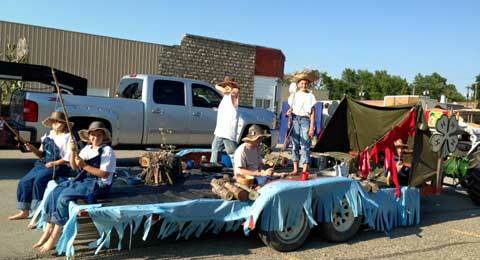 Willing Workers 4-H Club had the first-place 4-H float in this year’s Overbrook Osage County Fair parade. Realistic: First place, Kansas State Bank; second place, Searchlight Club. Humorous: First place, Overbrook Rotary; second place, Red Hatters; third place, Tiny Tykes University; fourth place, Overbrook Gas and Convenience. 4-H Float: First place, Willing Workers 4-H Club; second place, North Osage 4-H Club. First place, Topeka High Drumline. Second place, Santa Fe Trail High School. Third place, Baldwin City High School. 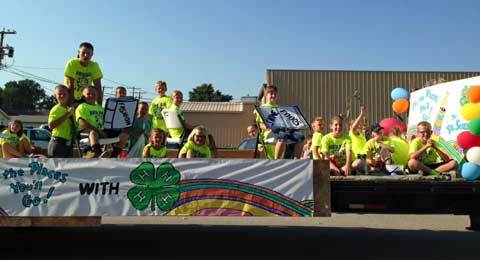 North Osage 4-H Club rides the second-place 4-H float. Information thanks to Denise Hoback. Photos thanks to Frontier Extension District.